Need to power your microscopic electronics? Don’t think high-tech, think Medieval. Like a team of miniature horses at a mill, Italian scientists have harnessed the movement of bacteria to turn a rotor just 48 microns wide. Researchers at the University of Rome placed an asymmetric cog in a bath of E. coli bacteria moving around randomly. Surprising many, the seemingly random bacterial movement allowed the rotor to rotate at about 1 rpm. The work is currently published on the online archive ArXiv.org. When fully harnessed, the motion of bacteria could become a viable means to power microscopic or even nanoscopic technology. The motion of bacteria caused this notched cog to rotate. The yellow circled dot is a reference point. Many proposed concepts of harnessing bacterial motion actually involve harnessing the bacteria with tiny molecular strings. Others want to use the “carrot” approach, encouraging bacteria to push a rotor by making it appealing somehow. The University of Rome team’s work shows that we can get power without all this effort. Just the natural movement of E. coli is enough to turn an asymmetric cog. While they will undoubtedly also pursue the harness or carrot approach, the Italian team has proven the most basic concept works. This means that we have an entirely new potential source of power at our disposal. Like batteries made from viruses we’ve discussed before, bacterial motors could be scaled up to function at the human scale, but are much more likely to be used in microscopic applications. Imagine tiny computer chips that you could could power with sewage (E. coli food), or biosensors that were powered and triggered by the bacteria around them. The choice of E. coli bacteria gives this project a wide range for possible improvement. E. coli have whip-like tails called flagellum that allow them to propel themselves. Although they are just 3 microns long, the bacteria can travel up to 10 body lengths per second. The current linear speed of the rotor is just about 2 microns per second, so we could possibly see a ten fold increase if the bacteria speed were optimized. Likewise, only 20% of bacteria are moving the rotor in the correct direction, if this were optimized we could see a five-fold increase in force applied. 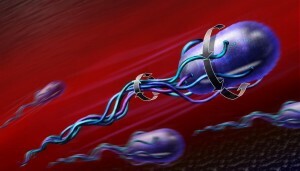 E. coli have whip like flagellum to propel themselves. Of course, E. coli are also one of the most commonly used organisms in genetic engineering. Many of the components of MIT’s Registry of Standard Biological Parts can be spliced into E. coli, and that species is a regular at the annual iGEM competition. Although the technique hasn’t been used so far, genetic alterations to the bacteria could help make the University of Rome’s motor a viable power source for miniature devices. While still squarely in its infancy, bacteria power is an exciting concept. Again, I doubt it will be used on the human scale because it’s not as practical as solar, wind, or even algae biofuel. On the microscopic scale though, the bacterial motors may become very important. Current battery technology is nearing it limits in miniaturization and a new paradigm is going to need to take over as our electronic devices become increasingly smaller. E. coli randomly pushing a rotor may be the new paradigm. Of course, if it isn’t widely adopted, I’m still going to think its pretty cool. I mean, hard-working bacteria powering a tiny motor – that’s a Far Side cartoon just waiting to be written. Where’s Gary Larson when you need him?